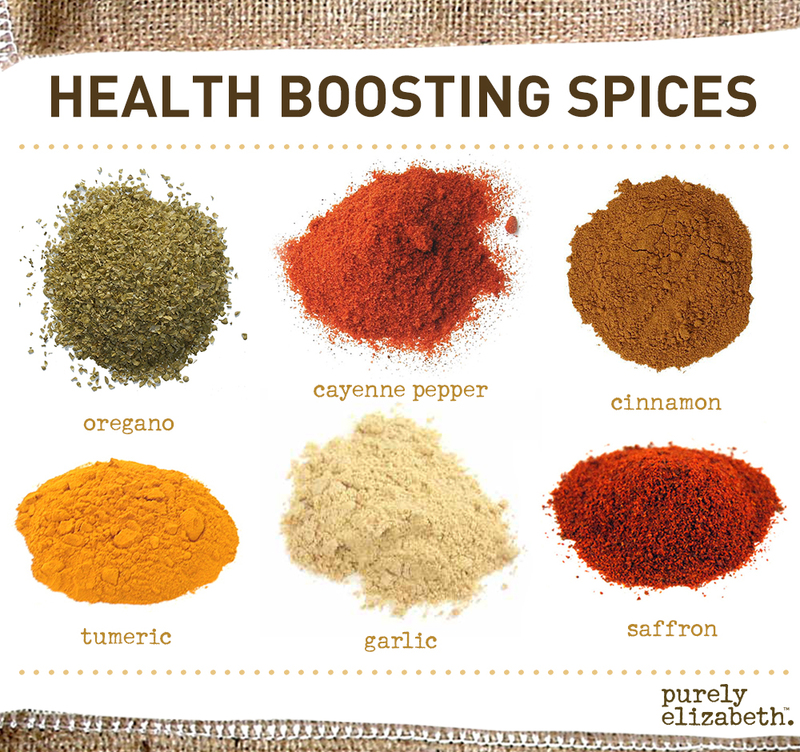 Health Boosting Spices | eat purely. live purely. Oregano- Oregano contains essential oils, along with the ingredients thymol and carvacol, which may boost your immune system and protect from certain strains of bacterial infections. Oregano is also rich in vitamins, nutrients and antioxidants. Cayenne Pepper- Cayenne peppers are rich in capsaicin, a compound found primarily in chili peppers, which has been shown to reduce inflammation when applied topically. Cayenne peppers are also rich in beta-carotene (otherwise known as Vitamin A and the cause of it’s bright red color), along with antioxidants. Cinnamon- Cinnamon contains iron, calcium, manganese and fiber. Cinnamon has also been shown to have an effect on regulating blood sugar for people with type 2 diabetes and aids in reducing bad cholesterol. Saffron- Saffron has been used in Chinese medicine to improve blood circulation and cure bruises. It contains an ingredient called crocin which may also lower blood cholesterol and triglycerides in the body, help treat atherosclerosis and arthritis and promote learning and memory retention. Saffron also contains carotenoids, which are believed to inhibit skin tumors and improve eye and vision health. Visit our Facebook page + tell us what your favorite spices are for a chance to win a sample of our brand new ancient grain granola bars! Spices is really good speacially for the flavoring food i’ve been using this before and until now if you guys want a better taste for your food just visit ww.eherbz.com here you can choose different kind of spices. Tumeric is great, it has so many health benefits! Do you like Indian food? I usually add tumeric into any type of Indian dishes. Here is a recipe resource to try: http://www.eatingwell.com/recipes_menus/recipe_slideshows/turmeric_recipes. Let us know if you try anything good! I’ve heard a lot of good stuff about tumeric lately. Still, I’m not sure how to include more of it in my diet. Few recipes I make use this spice. March Makeover: Day 22 | eat purely. live purely.